Whether it be sports of food, the word extreme means something a little different to everyone. When we’re talking about the most extreme food, it’s a tough call to make. Which specific quality makes a food the most extreme? Is it the one that burns a hole in your mouth, the dish so disgusting that just the thought of it makes your stomach turn or is it a plate so large it could feed a small village? With sports, rock climbing isn’t more extreme than whitewater rafting. They’re both extreme in their own ways. So here, we mapped out the world’s top 10 extreme foods, according to a range of intense categories, each one extreme in its own way. Since 2012, South Carolina’s The PuckerButt Pepper Company has held the record for the spiciest chili in the world. It averages around 1,569,300 Scoville Heat Units (SHU), beating out the Bhut Jolokia, or the Trinidad Scorpion Butch T pepper, who’s hottest rating has come in at about 1.5 million SHU. The grand winner, The PuckerButt Pepper Company’s Carolina Reaper‘s hottest score was recorded at 2 million SHU. While a far more subjective category than spicy chilies, we’re pretty sure many will agree that breast milk cheese is one of the most extreme foods in the world, thanks to its dramatic ick-factor. In 2010, a New York restaurant made the news for serving cheese made from the chef’s wife’s breast milk. Since then, it’s become sort of an underground trend, and has even taken on the ice cream department in addition to cheese. Odds are, the most expensive food in the world cost more than your house… and it was a diamond-encrusted fruitcake worth $1.6 million in December 2005. The rich dessert came from Tokyo and took the baker half a year to design and create. The fugu is so poisonous that only specially trained, expert chefs are allowed to serve it in incredibly thin slices. Although considered a rare delicacy, the fish’s intestines are filled with poison that’s 1,200 times deadlier than cyanide. One wrong bite and a tiny tingling in your mouth could result in death within only 17 minutes. Guinness World Records documents a seemingly endless list of extreme foods, when it comes to size. From the biggest burrito (12,785.576 pounds) to the heaviest bagel 868 pounds, it seems that people have made the biggest of just about anything. The heaviest that we found, however, was the world’s largest pizza, which came in at the grand total weight of 26,883 pounds. The longest noodle was made in Japan in 2007, measuring in at 1,800 feet and 2 inches. The longest string of licorice was 1,702 feet and 9 inches. The longest sandwich? 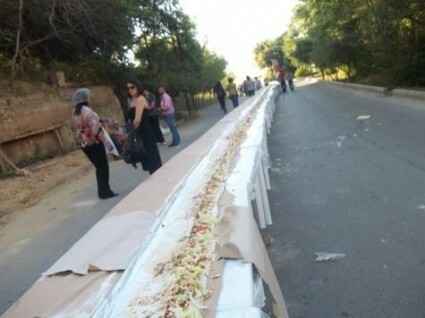 This tasty lunch was cooked up in Lebanon in 2011, measuring a grand total of 2,411 feet and 5 inches. Now that’s what we call the master of all sandwiches. Like the grossest food, the most deep-fried is also surprisingly subjective (and a little gross). 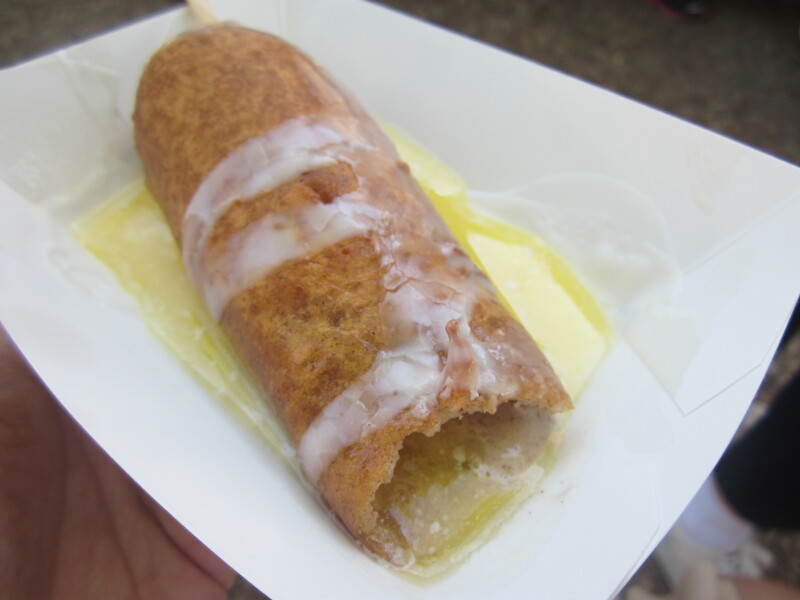 We crown the deep fried butter, which is available at the Iowa State Fair, the greasiest, most deep-fried food of all time… and you thought we were going to say McDonald’s. One of the rarest foods in the world is a black watermelon only grown on Japan’s northern island Hokkaido. The Densuke watermelon supposedly tastes similar to the green and pink ones we munch all summer long, except sweeter. In 2008, one sold for $6,100, making it the most expensive watermelon ever sold in Japan, and possibly even the world. 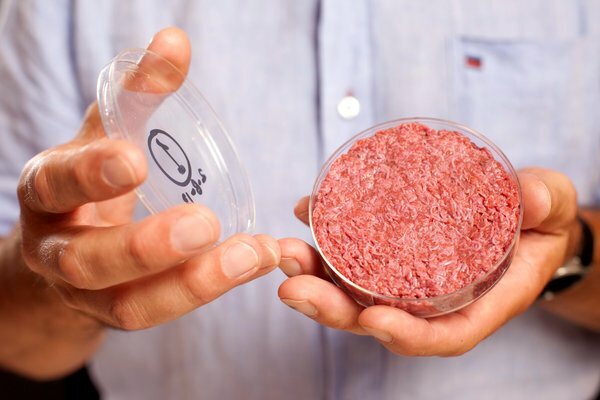 Vegetarians around the world can rejoice over the world’s first lab-grown burger, which publicly announced its existence earlier this year, but has yet to perfect the science behind it. It may be a while before synthetic meat is available in grocery stores, but the meat of the future could mean big changes to the way we eat, making it one of the world’s most extreme foods. Believe it or not, many of us eat the most dangerous food, according to Time Magazine, all the time. That’s because children choke on them so often. Apparently hot dogs are responsible for 17 percent of choking incidents in kids, making those wieners the riskiest food to eat.